I received no compensation to share this giveaway. 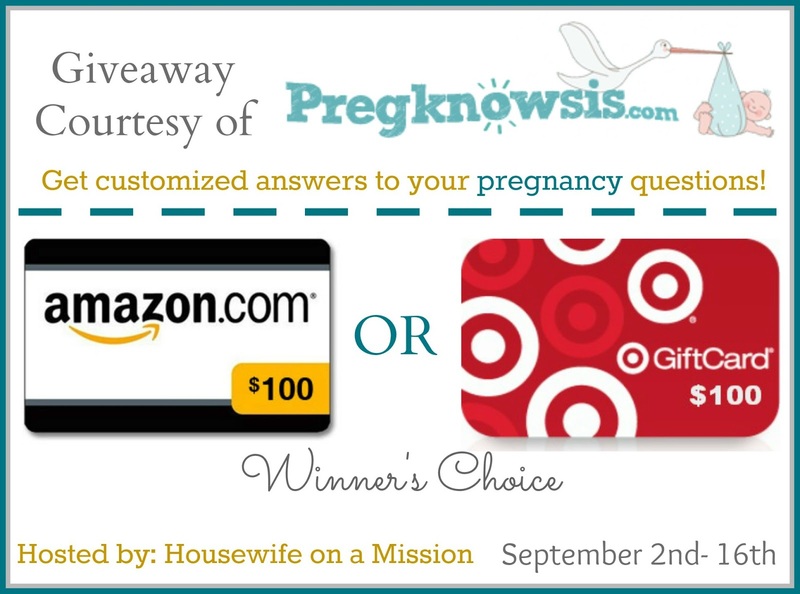 Pregknowsis.com, launched recently with the goal of taking some of the mystery out of pregnancy advice. It uses questions posed to a large community of users to generate individual answers, advancing online pregnancy conversation from folk wisdom and she say/she say to custom answers. It’s a novel concept which aims to lessen pregnancy guesswork. 1. A user goes to www.pregknowsis.com, creates a profile and answers a few lifestyle and demographic questions (age, diet, BMI, etc.). 2. Once registration is complete, users can go on and ask/answer their conception, pregnancy, or childhood related questions. Answers are instantly displayed using community answers in statistical form (individual users are anonymous). Once enough people answer a question, the answers become statistically significant (i.e. reliable) and gives users trustworthy information. So what are you waiting for? Register today for your FREE profile on Pregknowsis! One lucky reader is going to win their choice of a $100 Amazon gift card or a $200 Target gift card! Disclosure: Housewife on a Mission and the blogs participating are not responsible for prize fulfillment/shipment. Housewife on a Mission received monetary compensation for hosting this giveaway. We were not compensated in any way for the promotion of this giveaway. Facebook, Twitter, Pinterest, and any other social media are not affiliated with this giveaway. 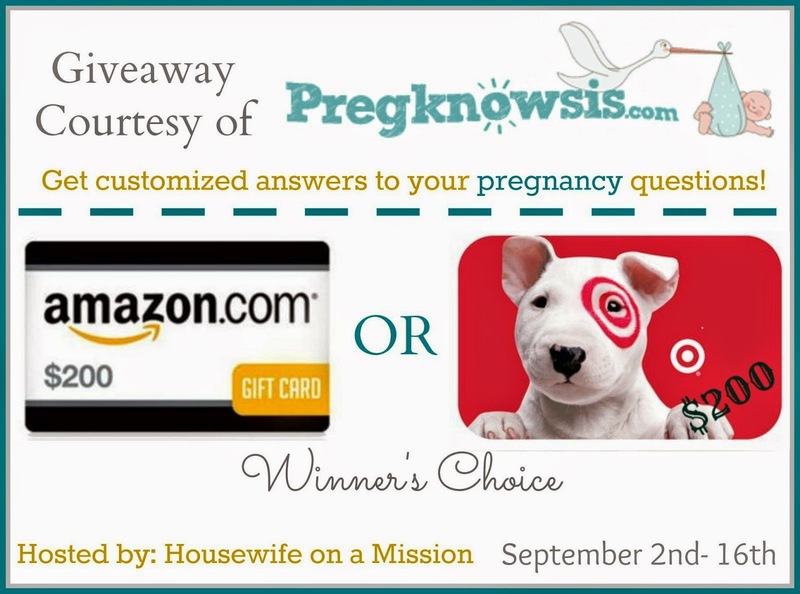 If you have any questions please contact the host of this giveaway at info(at)housewifeonamission.com.